Happy Holidays to All from Alström Syndrome International! From all of us at Alström Syndrome International, we wish everyone the Happiest of Holidays and the best of luck into the New Year! 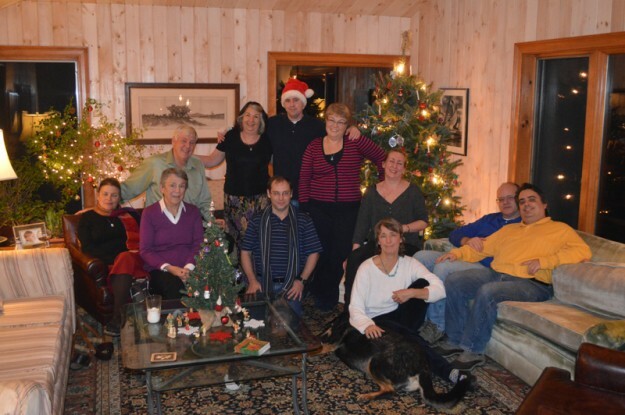 The photo shows the ASI crew at Jan and Robbin’s place, which is all decorated for the holidays! The 7th International Family Conference is just “around the corner” (May 9-13)! Many of you have made your reservations at the Plymouth Radisson; quite a few have submitted their Registration Forms; a few have already paid their Registration Fees. BUT, we are still waiting to hear from the majority of those who have indicated their desire/intention to attend! Do NOT wait until your plane reservations are made or your travel plans are solidified. We absolutely NEED to have a very firm idea of numbers in order to reserve spaces, work with the activity bus company, negotiate ticket prices for the kids, order T-Shirts in proper sizes, etc, etc, etc. PLEASE! Also, ASI operates on a “shoestring,” so any Registration/Activity Fees received prior to the actual conference really help ASI out when it comes to hefty deposits, which, these days, everyone expects in a timely fashion. If you have any questions or concerns, please get in touch with me by writing ASIRobin@hotmail.com.  At present, we have 336 individuals on the Conference Master List! Of those, between kids, A-Teamers, and their siblings, we expect 85-90 young(er) people.  Of the 46 names on our ASI letterhead, all but 4 have already committed to attending. Few other rare disorder groups can boast such an obvious show of commitment and support!  39 physicians and researchers, the Alström Syndrome brain trust if you will, will convene before and during the Family Conference in the first ever concurrent Scientific Meeting. These are the very best and brightest, the most experienced, the best informed, and the most caring group of professionals ever to have under the AS roof at one time! Many will speak during scheduled sessions; ALL will be accessible throughout the weekend; MANY will be available during the Curbside Consultations.  All but the very youngest children and siblings will visit Boston for the day on Friday, ride on the famous Duck Boats (by land and by sea), visit the extraordinary “hands on” Science Museum, the wonderfully dim Boston Aquarium, and maybe take in a movie at the impressive IMAX theater.  Saturday will be Plymouth Day for the kids with tours of the Mayflower and of Plimoth Plantation where several of their programs will be adapted to accommodate our special needs.  The youngest children will visit local venues like “Imagination Island,” the nearby playground, and the petting farm.  The A-Team likes to chant “No blood, no pee, no EKG,” but the information collected at the Family Conferences during the clinics has contributed hugely to our understanding of AS and to much improved care and treatment for our kids. And, as many of you know, the A-Teamers are first in line to shed blood for the cause! So, yes, there will be early morning clinic activities (SORRY!). We are EXCITED about seeing everyone in a matter of months! Do what you can to get us the information we need to help everything proceed smoothly – PLEASE.